It’s definitely a challenging one with some movement interference. The back squat can come from the rack but if you are confident with taking it from the floor you can also do this. I would only suggest that if you are familiar with racking the bar to your back, otherwise go out of the rack. Weight should be something you can confidently get 7 reps with but should get challenging with the kettlebell work. 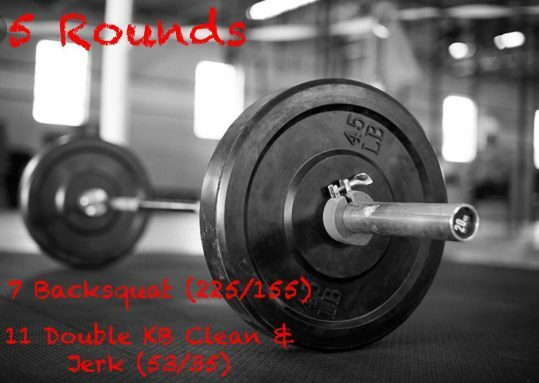 KB’s should be moderate weight and see if you can do no more than 2 sets on any round to finish the set of 11. This one is a burner so pace a bit from the beginning and be confident with that fitness. Adjust the loading on both movements if needed in order to meet the goal time domain but work to keep the reps the same.